SINGAPORE - The ongoing overhaul of the ageing North-South East-West lines will be fully completed by 2024, Transport Minister Khaw Boon Wan announced on Tuesday (Sept 12). But he expects commuters to experience "vast improvements" in reliability by 2019, as projects to replace the core systems of the two lines are ticked off. He was speaking at the Bishan Depot to mark the completion of the second major upgrading project for the North-South East-West lines - the replacement of the power-supplying third rail. The first major North-South East-West lines upgrading project, completed in 2016, was the replacement of timber sleepers with concrete ones. Sleepers help hold the tracks in place. Mr Khaw said the replacement of the power-supplying third rail, completed in August, made it "two down, with four more to go", referring to the four outstanding North-South East-West lines renewal projects: the upgrading of the signalling system, power supply system and track circuits, and replacement of the first-generation trains. "Each time you replace a core system, there will be a quantum improvement," he said. Mr Khaw added that this can be seen in the improvement in reliability for the North-South Line ahead of the East-West Line, as the North-South Line was upgraded first. This is captured in the mean kilometre between failure (MKBF) measurement, which counts delays of more than five minutes. The North-South Line registered a better 345,000 train-km in the first half of 2017, while the East-West Line stood at 282,000 train-km. 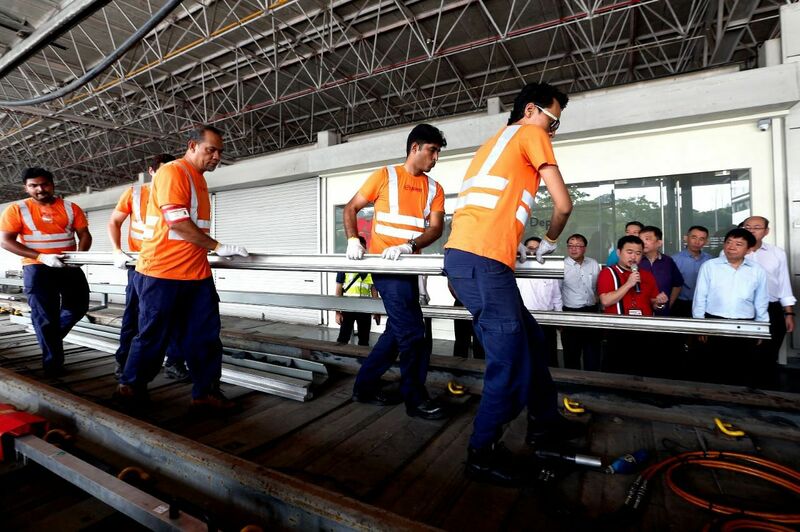 The Land Transport Authority (LTA) and transport operator SMRT said that works to upgrade the third rail along approximately 180km of tracks started in September 2015, with the final section near the Ang Mo Kio MRT station replaced in August. 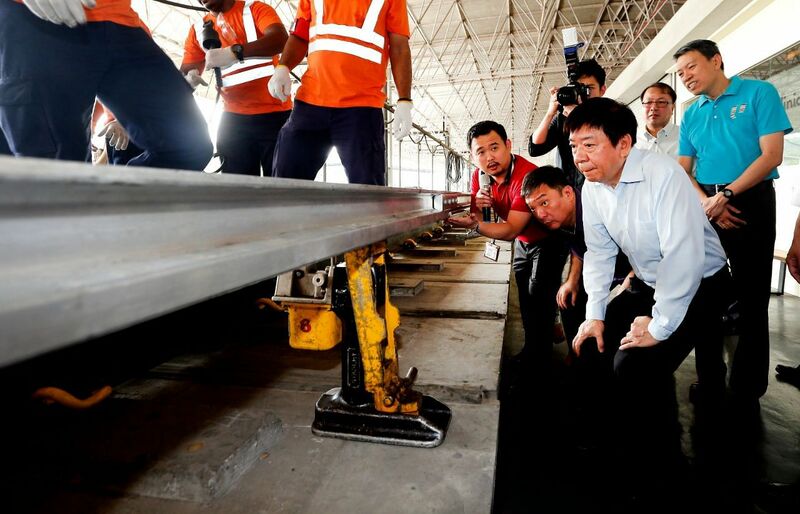 "With a newer and more robust design, power faults related to the third rail can be minimised and overall reliability of the North-South and East-West Lines will improve," Mr Khaw said. In 2016, third-rail problems caused 18 delays that lasted more than five minutes each time. Reiterating what he told Parliament the day before, Mr Khaw said: "We are half-way there. The cup is half-full, and the data shows it. Next year, we will fill it up some more." Mr Khaw said he expects the full-day testing of the North-South Line's new signalling system to be completed later this year, and he is gunning for the testing of the East-West Line to commence in December. "There will be some delays for East-West Line commuters when testing starts, please bear with us," he said. Mr Ngien Hoon Ping, chief executive of LTA, said: "We will be embarking on more major infrastructure renewal projects, such as the replacement of the North-South East-West lines power supply system and first-generation trains. "The tenders for these renewal projects have closed, and LTA is currently evaluating the bids. When these projects are completed, we are confident that commuters can enjoy even better rides." Both projects are expected to start in 2018 and finish by 2023. A separate project to upgrade the track circuit system for the North-South East-West lines - a secondary system that detects the location of trains on the tracks - will start in 2018 and be completed by 2024, capping off the refurbishment of the 30-year-old lines.